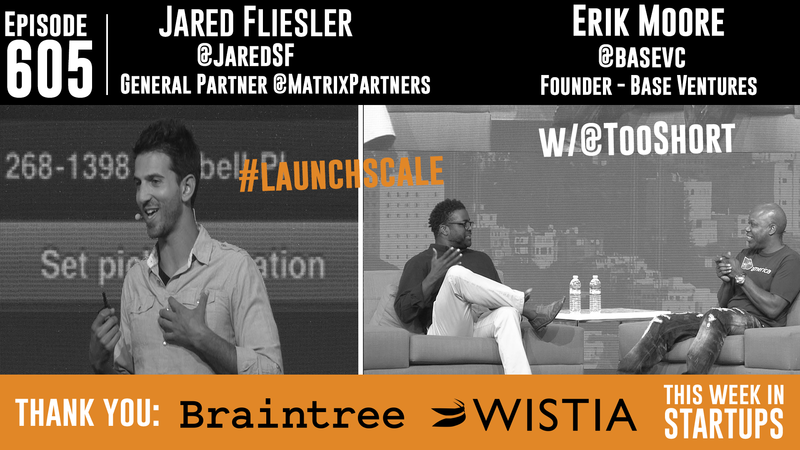 Two of the top-rated speakers from LAUNCH Scale 2015! First is Jared Fliesler, General Partner at Matrix Partners and former growth & product guru at Square, Google, and Slide. Jared shares his best strategies on product marketing, focusing on one thing as a startup, and developing clear, concise and compelling messaging. Second is Erik Moore, Founder of Base Ventures, who offers rock star tips on seeking VC capital and the importance of hustle. And Erik has an awesome surprise … he invites Bay Area rapper Too Short to the stage, who tells us how he employed entrepreneurial hustle to build his business. 3:21-4:00: Jared lays out the three components a company needs to thrive. 7:29-8:45: Jared provides five key questions you need to ask yourself when you’re building your product. 9:52-11:29: Jared explains why Namely and Uber are great examples of companies with focus. 13:29-14:22: Jared says customers create value in four different ways. 14:28-15:48: Jared dares entrepreneurs to accept that the status quo might be enough. 17:01-18:35: Jared explains how to argue that now is the time for your product. 19:06-20:45: Jared thinks the Golden Gate Bridge is the perfect example of building something great. 22:27-24:07: Jared details how to craft your message in three steps. 26:56-29:08: Jared says you need to be able to explain your product in less than 30 seconds, ideally in one sentence. 29:09-33:02: Jared demonstrates how to earn customer trust through big brands and singular customers. 39:03-41:43: Jared breaks down the genius of the iPhone 6 campaign, and how it can teach you how to market. 42:50-44:11: The audience wants to know if you should test your message with the press. Jared doesn’t think so. 49:19-51:12: Should you hire branding professionals to handle your marketing? Jared says be honest about how hard this step is for you. 63:30-66:05: Erik asks Too Short how he invented the hustle in the ‘80s.